Ambassador Christopher R. Hill is a distinguished 33-year career diplomat from the U.S State Department. A four-time ambassador under three U.S presidents, Ambassador Hill served in Macedonia, Poland, South Korea and finally in Iraq, where he was appointed by Secretary Hillary Clinton. Some of Ambassador Hill’s most challenging assignments were North Korea, where he served as chief disarmament negotiator, as well as Bosnia and Kosovo. He was also President Bush’s assistant secretary to East Asia. Ambassador Hill is recipient of many State Department awards, including the Secretary of State’s Distinguished Service Award and the Robert S. Frasure Award for Peace Negotiations. Ambassador Hill is currently the Dean of the Josef Korbel School of International Studies at the University of Denver in Colorado and a monthly columnist for the online journal Project Syndicate. 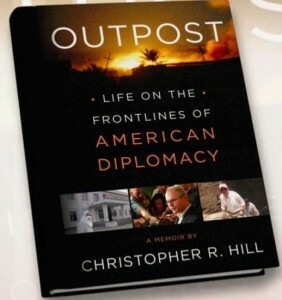 In early October of this year he published his memoir Outpost: Life on the Frontlines of American Diplomacy, which is a recap of over three decades of service at the State Department. Foreign Policy Concepts spoke with Ambassador Hill to discuss his new book and share his views on U.S. foreign policy.